The wind is howling across the digital wastes. Sometimes it's a soothing ambient burr, and others it's a dissonant, uneasy keen. Occasionally it drifts over some clanging, industrial percussion. It feels like a force of nature. Anjou is the work of Labradford's Robert Donne and Mark Nelson, with occasional live percussion from Steven Hess. Hess is apparently an old hand with these kinds of projects, having worked with both Pan American and Fennesz. This is very much in the same wheelhouse as Fennesz, and bears little resemblance to early Labradford's guitar-heavy post-rock. The ruling element here is a staticky drone, presumably a combination of synthesizer and Max/MSP-processed texture, though it could just as easily be a mutilated field recording. Within that drone are numerous subtle rhythmic variations and snippets of melody, as well as frequent dissonant skronk. Song-structures are present but seem to shift in and out of focus as if they were emerging from or receding into fog. Tracks similarly blend together into a blend of moods and modes. The tempo is generally slow and meditative. There's a hint of portent to these tracks, as if awaiting an oncoming storm. In case that description doesn't make it clear, this is music that requires intense focus. Left in the background, Anjou could be mistaken for nothing more than a wash of noise. Some of the instrumentation here is so minimal that it's practically subliminal. 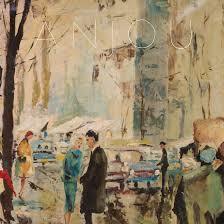 But given the appropriate attitude and appreciation for this genre, Anjou has possibilities. Fans of Fennesz and William Basinski will find much to like here. Let the drone take you over, and you'll start to hear the changes.